Artists in the Renaissance such as Mantegna and Bellini drew above all to study and to experiment. They made first sketches on paper in broad strokes to record ideas. Sometimes the position of a figure was tried out, so that the same figure appears several times on the same sheet. Ideas for a picture were subsequently further developed in complete compositions. These preparations were followed in the creative process by working drawings, which aided in bringing figures or landscapes onto the canvas, panel, or wall surface. 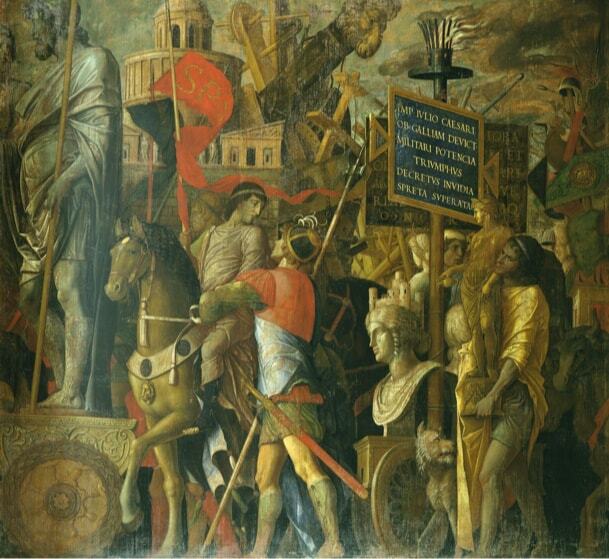 The series of the Triumphs of Caesar, a cycle of nine paintings, was painted by Mantegna between 1486 and 1506. All of the pictures measure approximately three by three metres and are thus relatively large. 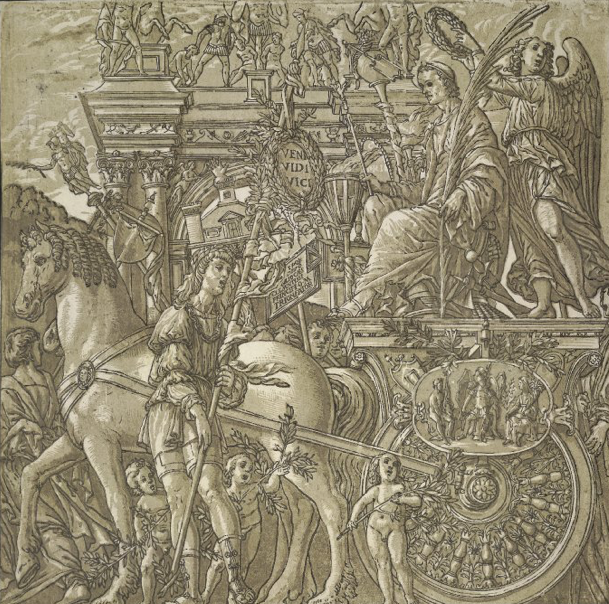 The painter merged various literary sources from antiquity on Caesar’s triumphal processions. The series has always been considered among Mantegna’s masterworks. 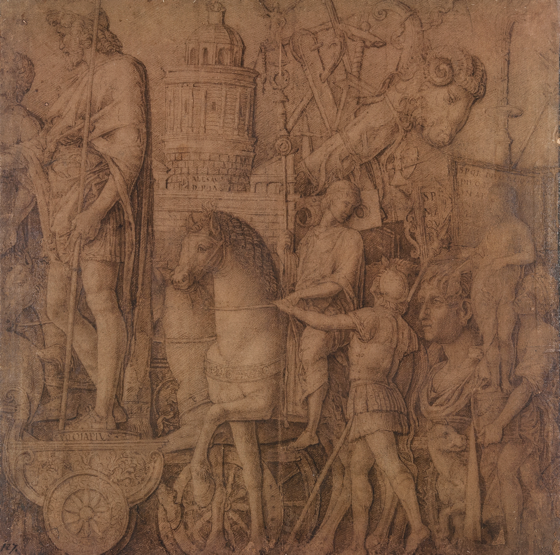 This small-format drawing was presumably used by Mantegna to present the picture’s conception to his patron or to experiment with the composition in a square format. 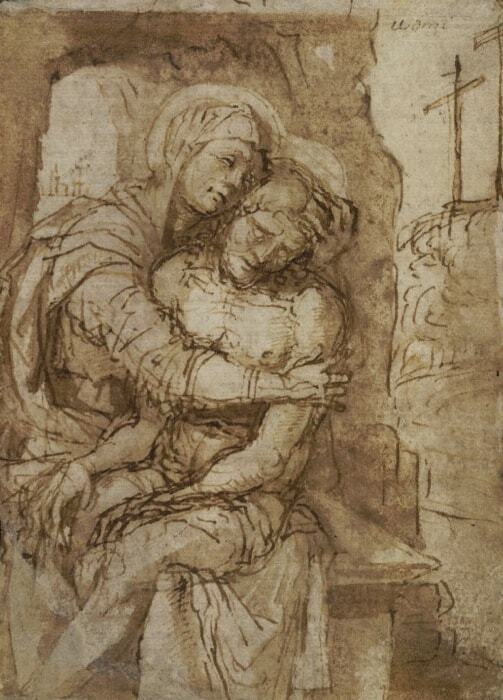 Many drawings must have been made to prepare the series of nine paintings, but only a few have survived. Archives frequently contain documents referring to paintings, such as contracts, inventory lists, or mentions in letters. In contrast, drawings served as drafts or working tools in the artist’s studio. The circumstances surrounding their creation were often not documented. 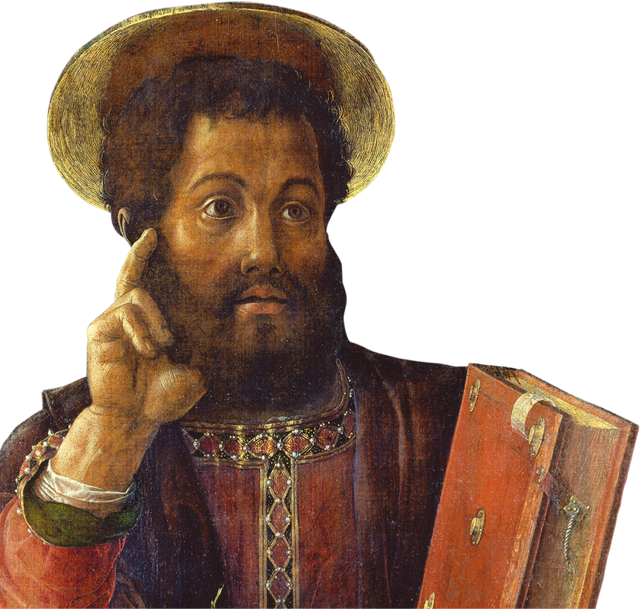 An example of this is a drawing by Bellini of Saint Mark, which today cannot be linked to any known painting. 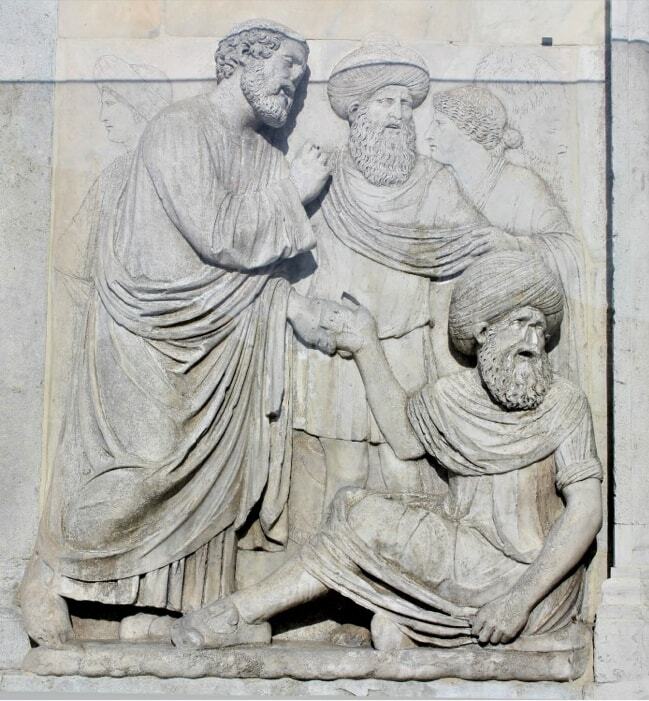 The subject, however, appears in Venice in several reliefs showing the same scene. One of them is located in the Scuola Grande di San Marco, the seat of the influential brotherhood that also included Giovanni Bellini as a member. Mantegna and Bellini transformed their manners of working in reaction to one another. They each appropriated motives from one another. In many of Bellini’s paintings, such as Saint Jerome, the brushwork so resembles Mantegna’s that one could assume they had closely worked together. In particular the first signed works by Giovanni, in which he distanced himself from his father, are influenced by Mantegna’s style of painting. 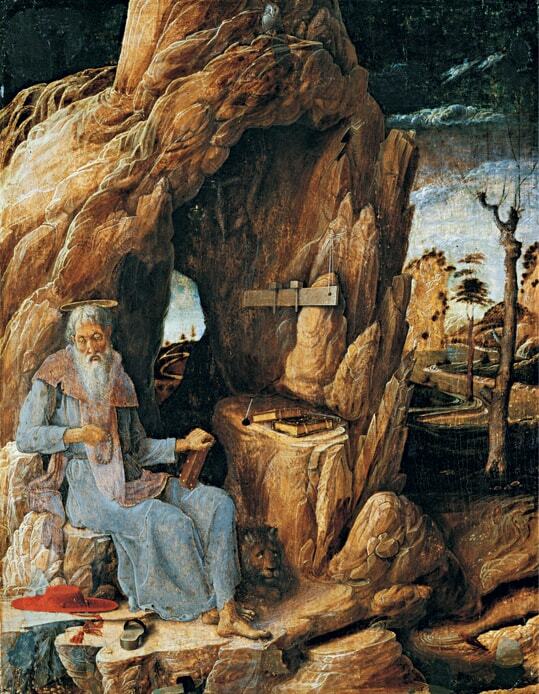 The small panel Saint Jerome in the Wilderness from the beginning of the 1450s is considered Giovanni Bellini’s earliest surviving work. Shortly before, probably around 1448–1451, Mantegna also took on the same subject. 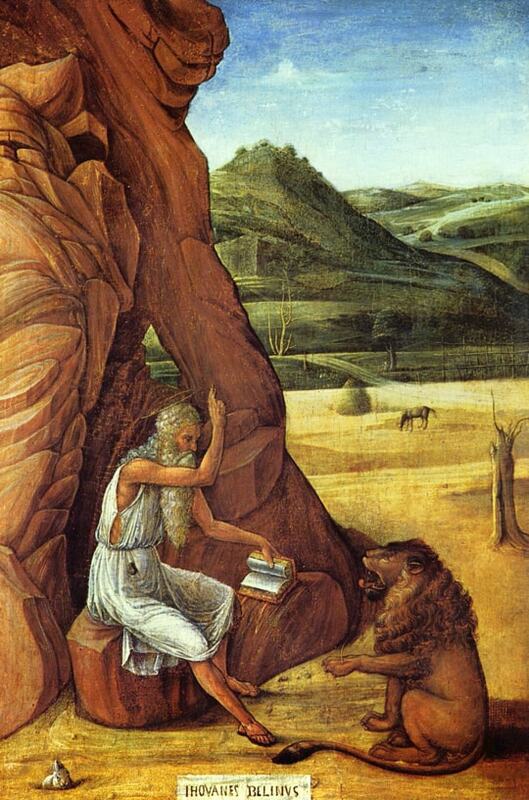 Jerome is shown here with the lion, from whose paw – according to legend – he extracted a thorn. The lion was thus tamed by Jerome and became his constant companion. 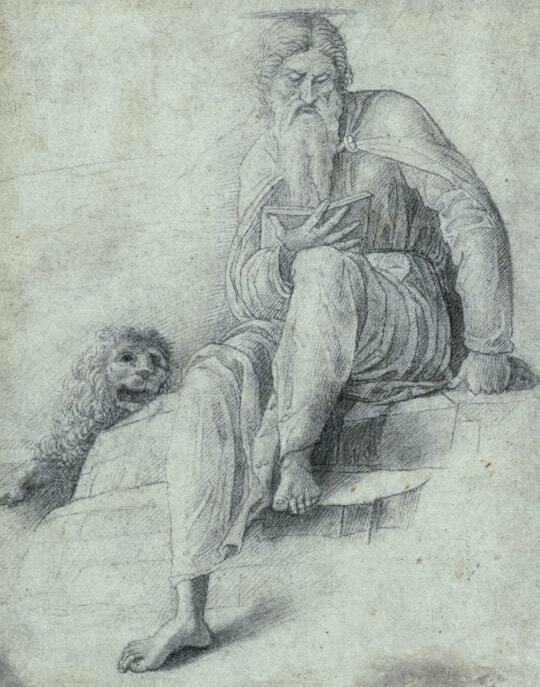 The drawing Saint Jerome with the Lion is a further link in the work of the two artists. 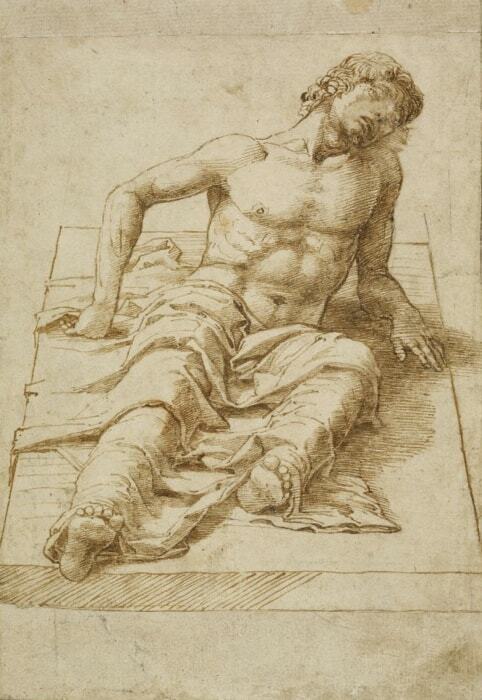 Various hypotheses have been suggested in recent decades to explain how this drawing came about: it has been attributed to Bellini as well as to Mantegna and regarded as an alternative draft for Mantegna’s painting today in São Paolo. It was probably made by a member of Mantegna’s circle and modelled on Bellini’s paintings. 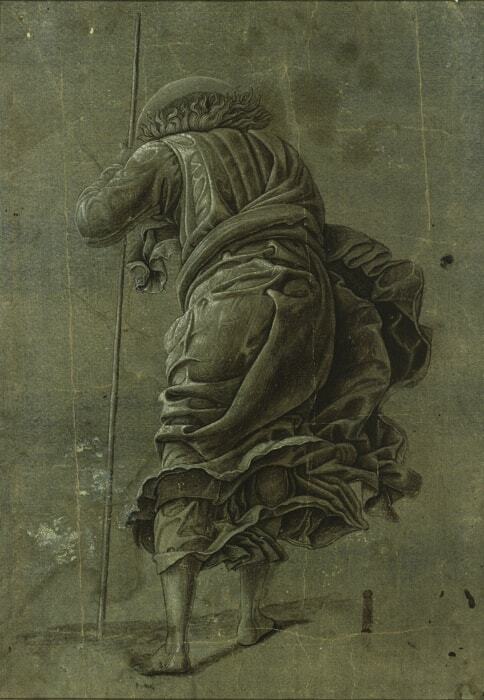 The type of underdrawing is typical of Mantegna, yet the use of black chalk of Bellini. Mantegna depicts Jerome surrounded by objects alluding to his life and work. Many of these details represent intellectual studies, anchoretic flight from the world, and solitary prayer, such as the rosary and the wooden board on the cave’s wall. The latter could represent a semantron, used in Orthodox monasteries to call the monks to prayer. 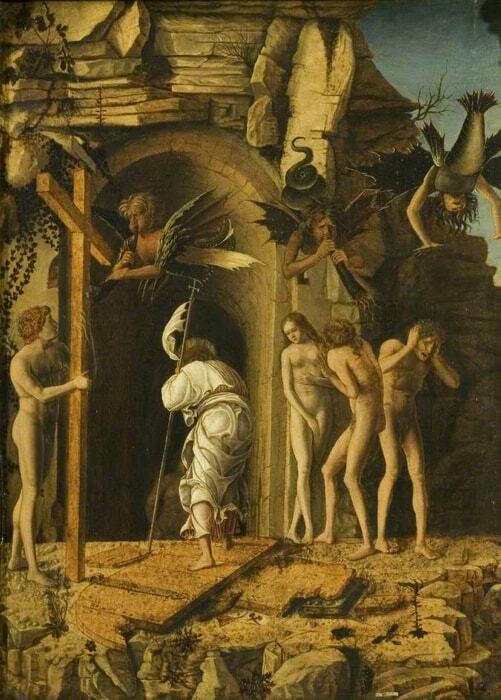 A further example of the collaboration between the two artists is the picture Christ in Limbo in Bristol: it was presumably drawn in Mantegna’s studio and then reached Bellini in some manner unknown to us today. The colouring and the compositional additions of the landscape indicate that it was completed by Bellini. 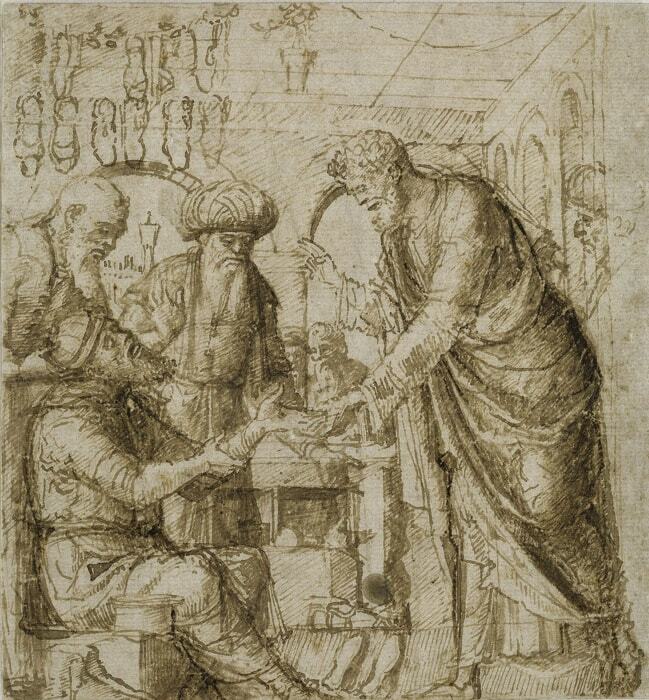 The leaf of parchment with a drawing probably made by Mantegna himself is worked out in detail. Several empty spots indicate, however, that it was never completely finished. A support such as parchment suggests that it was probably a presentation drawing rather than for workshop use. 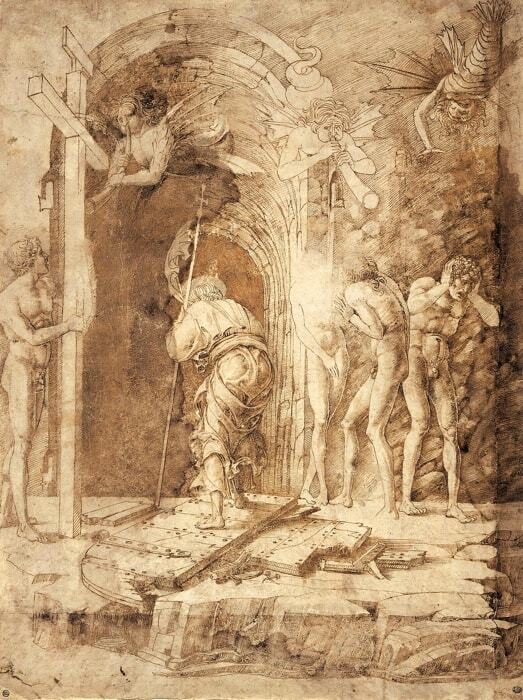 Details in the drawing evidence close resemblances to the engraving, for example the outlines of the figures and the broken wing of the door. The Berlin engraving therefore presumably was modelled on this drawing. The distinctive depiction of this episode from Christ’s life with the main figure seen from behind inspired numerous copies. 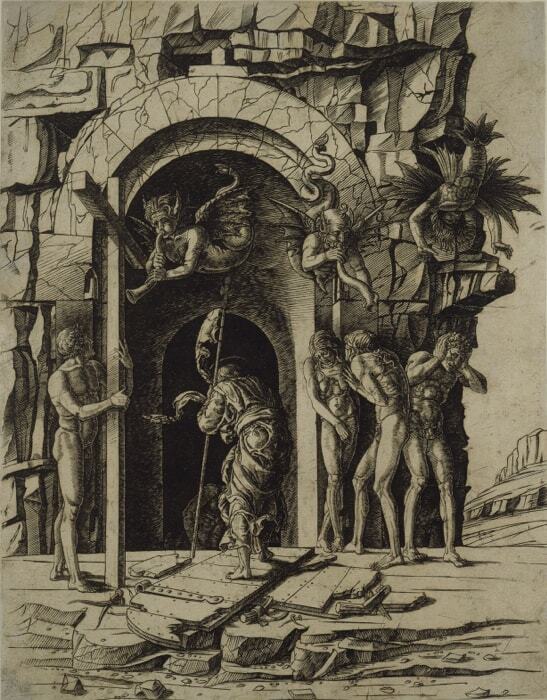 A member of Mantegna’s workshop copied the main figure, isolated from the scene, as a ricordo, in order to use this composition in another context. The Legende Aurea (i.e. Golden Legend), a collection of hagiographies of the Holy Family and of other saints, narrates Christ’s descent to limbo. In the time between His burial and resurrection He was supposed to have descended into hell, into limbo, in order to rescue the good souls. He first freed Adam and Eve, portrayed next to Christ in the variants by Mantegna and Bellini. Satanic creatures blast them with hellish sounds, while Christ turns to the depths and rescues further souls.